For the asteroid, see 8852 Buxus. "Boxtree" redirects here. For the publisher, see Macmillan Publishers. "Boxwood" redirects here. For other uses, see Boxwood (disambiguation). 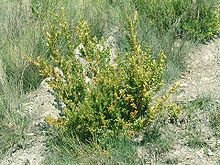 They are slow-growing evergreen shrubs and small trees, growing to 2–12 m (rarely 15 m) tall. 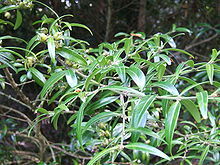 The leaves are opposite, rounded to lanceolate, and leathery; they are small in most species, typically 1.5–5 cm long and 0.3–2.5 cm broad, but up to 11 cm long and 5 cm broad in B. macrocarpa. 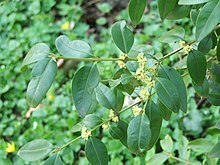 The flowers are small and yellow-green, monoecious with both sexes present on a plant. The fruit is a small capsule 0.5–1.5 cm long (to 3 cm in B. macrocarpa), containing several small seeds. The genus splits into three genetically distinct sections, each section in a different region, with the Eurasian species in one section, the African (except northwest Africa) and Madagascan species in the second, and the American species in the third. The African and American sections are genetically closer to each other than to the Eurasian section. Box plants are commonly grown as hedges and for topiary. 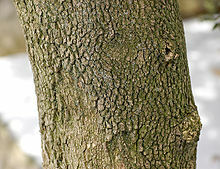 In Britain and mainland Europe, box is subject to damage from caterpillars of Cydalima perspectalis which can devastate a box hedge within a short time. This is a recently introduced species first noticed in Europe in 2007 and in the UK in 2008 but spreading. There were 3 UK reports of infestation in 2011, 20 in 2014 and 150 in the first half of 2015. The white pieces are made of boxwood. 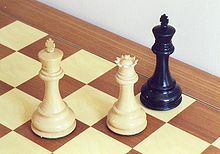 The black piece is ebonized, not made of ebony. Owing to its fine grain it is a good wood for fine wood carving, although this is limited by the small sizes available. It is also resistant to splitting and chipping, and thus useful for decorative or storage boxes. Formerly, it was used for wooden combs. 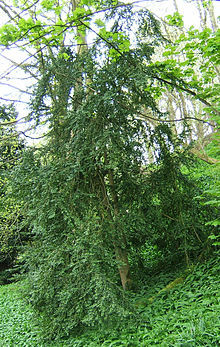 As a timber or wood for carving it is "boxwood" in all varieties of English. Owing to the relatively high density of the wood (it is one of the few woods that are denser than water), boxwood is often used for chess pieces, unstained boxwood for the white pieces and stained ('ebonized') boxwood for the black pieces, in lieu of ebony. The extremely fine endgrain of box makes it suitable for woodblock printing and woodcut blocks, for which it was the usual material in Europe. In the 16th century, boxwood was used to create intricate decorative carvings, including incricate rosary prayer beads. As of 2016, the largest collection of these carvings is at the Art Gallery of Ontario in Toronto. High quality wooden spoons have usually been carved from box, with beech being the usual cheaper substitute. Boxwood was once called dudgeon, and was used for the handles of dirks, and daggers, with the result that such a knife was known as a dudgeon. Although one "in high dudgeon" is indignant and enraged, and while the image of a dagger held high, ready to plunge into an enemy, has a certain appeal, lexicographers have no real evidence as to the origin of the phrase. Due to its high density and resistance to chipping, boxwood is a relatively economical material, and has been used to make parts for various stringed instruments since antiquity. It is mostly used to make tailpieces, chin rests and tuning pegs, but may be used for a variety of other parts as well. Other woods used for this purpose are rosewood and ebony. Boxwood was a common material for the manufacture of recorders in the eighteenth century, and a large number of mid- to high-end instruments made today are produced from one or other species of boxwood. 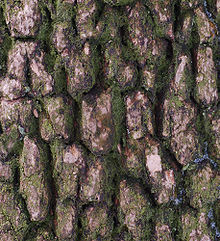 Boxwood was once a popular wood for other woodwind instruments, and was among the traditional woods for Great Highland bagpipes before tastes turned to imported dense tropical woods such as cocuswood, ebony, and African blackwood. General Thomas F. Meagher decorated the hats of the men of the Irish Brigade with boxwood during the American Civil War, as he could find no shamrock. ^ von Balthazar, M.; Endress, P. K.; Qiu, Y.-L. (2000). "Phylogenetic relationships in Buxaceae based on nuclear internal transcribed spacers and plastid ndhF sequences". International Journal of Plant Sciences. 161 (5): 785–792. doi:10.1086/314302. ^ "Chess Piece Materials". The Chess ZoneDiaphania perspectalis. ^ "Inner Space: In Small Wonders, the AGO's strangest possessions take centre stage". Toronto Star, November 13, 2016. Page E1. Murray White. ^ See Theocritus Idyll 24.110, where Heracles is taught to play a boxwood lyre. ^ Joshua Dickson (9 October 2009). The Highland bagpipe: music, history, tradition. Ashgate Publishing, Ltd. pp. 50–. ISBN 978-0-7546-6669-1. Retrieved 29 April 2011. ^ "Illustrations of the Irish Brigade at Fredericksburg". Irish in the American Civil War. Damian Shiels. November 27, 2011. Retrieved January 12, 2017. Wikimedia Commons has media related to Buxus. Wikisource has the text of the 1911 Encyclopædia Britannica article Boxwood.